Line 6 has expanded its amp modelling lines by adding two new combos: the Spider Jam and the Micro Spider. The 75watt Spider Jam is touted by the company as being "the new standard in jamming tools." Based around the new Endless Jam engine, the Spider Jam features over 100 onboard loops recorded by LA and Nashville session musicians, and is designed as a practicing and songwriting tool, and recording device. Guitarists will be able to solo along to the loops and record their own, facilitated by the Spider Jam's 14-minute capacity memory. The amp has hundreds of artist-designed presets, built-in digital effects, and comes loaded with a 12" Celestion Custom speaker and a 2" tweeter. 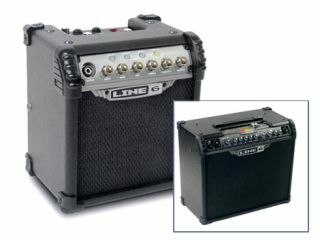 Line 6's new Micro Spider is a portable, battery-powered amp that delivers 6watts of power through a 6.5inch speaker. It runs on six C-type batteries and despite its small size, Line 6 claims it packs a mean punch. Five amp models are on offer: acoustic, clean, crunch, metal and insane. Digital effects such as tap delay, reverb, chorus and more are also promised, and the onboard tuner and direct output should make the amp ideal for practicing, home recording, or, should the mood take you, busking. The two amps are expected in ship spring 2008; the Spider Jam will cost $449 and the Micro Spider $139. More info is available on Line 6's website. Watch a Spider Jam demo with Adrian Belew.